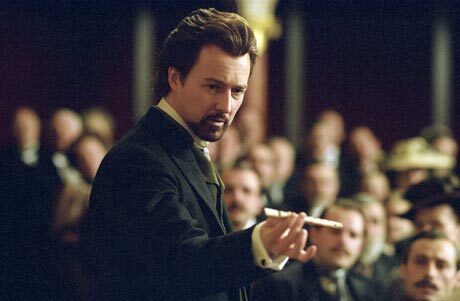 Playing a master of slight of hand, disappearances and other tricks of the 19th century illusionists trade, Edward Norton manages to distract us only briefly before we realise that theres not much behind this tale of supernatural romance. Norton is Eisenheim the Illusionist, delighting Viennese crowds with instantly growing fruit trees; as his reputation rises, he gains the attention of Crown Prince Leopold (Dark Citys Rufus Sewell), as well as the citys Chief Inspector Uhl (Paul Giamatti). While Uhl is an eager, curious observer  and fancies himself a bit of an amateur conjurist as well  the attention Eisenheim draws from Prince Leopolds fiancé Sophie (Jessica Biel) angers the man who would be Emperor. Neil Burger, adapting the film from a short story by Steven Millhauser, sets up the atmosphere reasonably but does little to let us into Eisenheims world. Only at plot convenient points do we realise that Sophie and the magician shared a brief but life defining childhood moment, and from the second she steps on stage to participate in one of his tricks, their life paths inevitably follow down the road of tragic movie romances between power and poverty. With Inspector Uhl charged with proving Eisenheim a fraud and Prince Leopold growing ever angrier at the magicians fame and influence, Eisenheim embarks upon a most spectacular show, engineering an escape not just from stage but from Vienna and Leopolds clutches.